The Tricam TRP-8X10PVC-WG Weather Guard PVC Tarp is used on trailers, boats and other objects for protection against weather, rust and other corrosives. This extreme-duty tarp is thicker and stronger than standard tarps and weighs 11.2-ounces per square yard versus the standard 3.5-ounces per square yard tarp. 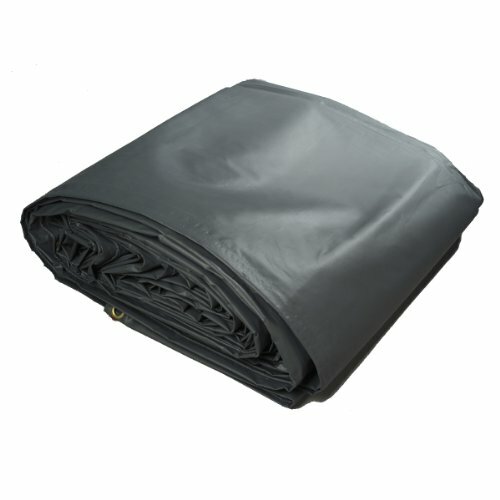 This heavy-duty tarp features a reinforced hem to prevent grommet slippage and is made of UV-resistant PVC laminate to protect against the sun's rays. It features rust-resistant brass grommets every 2-feet for extreme versatility, a variety of tying options, and measures 8-feet by 10-feet. The Tricam TRP-8X10PVC-WG Weather Guard PVC Tarp comes with a 1-year limited warranty. Tricam is a leading consumer products company who continues to lead the industry with innovative, patented designs throughout their entire product line. Tricam's products include household step stools, tarps, lawn and garden carts, replacement tires and tire tubes.